Actually, it’s not just Jonny whom I would like to move into the real world, but his entire extended family. That includes his dad, brilliant scientist Benton Quest; his best friend Hadji; and the family bodyguard Roger “Race” Bannon. The original 1964-65 animated adventure series is a true classic. Like all Hanna-Barbara TV entries, it used somewhat limited animation. But great characters designs (by artist Doug Wildey) and nifty locations, vehicles and scientific devices were all combined with solid storytelling. The results were 26 half-hour episodes that still entertain over 4 decades later. Images from several episodes are, in fact, practically iconic. The giant mechanical spider-thing in “The Robot Spy,” for instance, is a magnificent visual. The sequence in “Turu the Terrible,” in which Dr. Quest and Race don jet packs and grab a bazooka in order to hunt down a pteranadon, is easily one of the coolest things ever. Dr. Quest, in fact, was the go-to guy for just about any sort of strange situation. Whether the problem was ships being mysteriously destroyed at sea, recovering an experimental missile from its crash point in the Arctic, or dealing with an apparent werewolf in the Canadian woods, Dr. Q was your man. Jonny was the sort of kid we all (as kids) wished we could be. His life consisted of travel to exotic places, highlighted by one adventure after another. If he had to tolerate the occasional assassin sticking a tarantula in his bed while he slept—well, that seemed to be a more-than-fair trade-off. 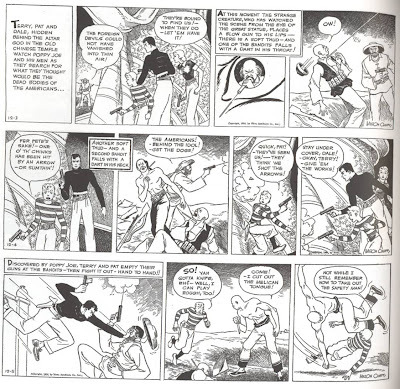 One of the admitted influences for Jonny Quest, Milt Caniff’s newspaper strip Terry and the Pirates is arguable the finest adventure strip ever. When it began in 1934, Terry Lee and his guardian Pat Ryan arrive in China, looking for an old mine left to Terry by his grandfather. The ensuing adventure, involving a bandit base secreted in the tunnels of the mine, was slam-bang exciting right from the start. Caniff proved to be a masterful storyteller. As the strip progressed, his art became more refined and realistic. The characterizations were wonderful, while the storylines always enthralling and often complex. 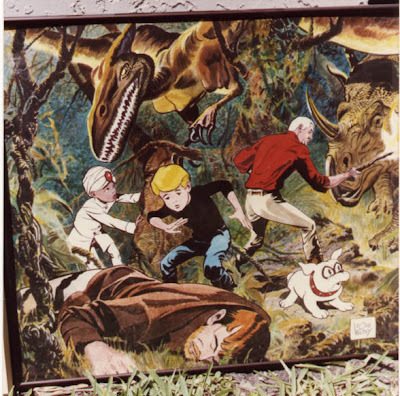 Terry was maybe twelve-years-old when the strip premiered and, like Jonny Quest, he had one heck of a childhood. He encountered pirates, bandits, invading Japanese soldiers, murderers and con artists. Villains came at him with fists, knives and guns, but he took it all in stride. Like Jonny, he was wish-fulfillment personified. He also met the absolutely best-lookin’ gals ever to grace a comics page. The Dragon Lady, Burma, April Kane, Raven Sherman—just to name a few. Caniff had a real talent for drawing a pretty lady. Terry aged normally as the strip progressed and was old enough to serve as a fighter pilot during World War II. By the time Caniff left the strip in 1946, Terry was flying a cargo plane around China while working undercover for Military Intelligence. But whether man or boy, Terry Lee was one heck of a guy. 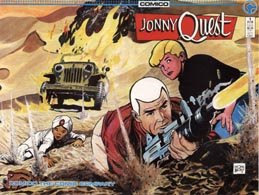 Neither he nor Jonny Quest are real—but, by golly, they should be. He’s one of the most popular and best-known characters ever. There probably isn’t a single member of Western civilization who doesn’t recognize the name—and a fair percentage of the rest of the world would know who he is as well. 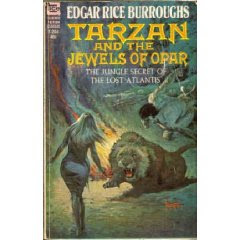 Tarzan is popular first and foremost because his creator—Edgar Rice Burroughs—was a magnificent storyteller. In Tarzan of the Apes (1912), Burroughs gave us an enthralling adventure story with a fascinating and archetypal protagonist. One interesting thing about Tarzan’s origin is that Burroughs’ didn’t know squat about Africa. In fact, he originally had Tarzan fighting tigers—not realizing there are no tigers on the Dark Continent. But all the same, he creates a fantasy version of Africa that we can easily accept as real. The tribe of apes that adopt the orphaned baby and raise him as one of their own don’t match up to any real-life simians, but their behavior (both as individuals and as a tribe) are logical and self-consistent. Tarzan eventually learns about the rest of the world and spends time in both Europe and America, but he never really cares for civilization, preferring the honest savagery of the jungle to the hypocrisy of modern man. Throughout the original twenty-four novels, he travels extensively throughout Africa, stumbling across a number of lost cities, often remnants of ancient civilizations. There was, for instance, a city left over from the Roman Empire, where Tarzan eventually ended up in the gladiatorial arena. Then there was a city populated by descendants of Crusaders who had gotten really, really lost on their way to the Holy Land centuries earlier. Danger, captures, escapes and many battles would ensue, but Tarzan’s high intelligence and matchless fighting skills would always see him through. Tarzan is the ultimate in wish-fulfillment, living exactly the life he wants to, without fear and always acting capably in all situations. 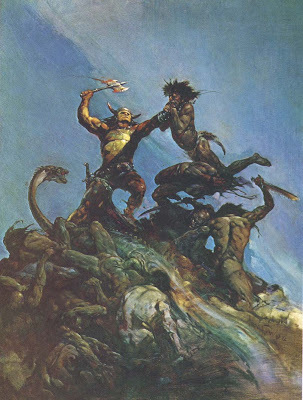 Conan was created in the 1930s by pulp writer Robert E. Howard. The big barbarian, who lived in an age before the beginning of recorded history, starred in 20 short stories and one novel. The best of these are among the most visceral and purely entertaining sword-and-sorcery stories. Like Tarzan, Conan was disdainful of the hypocrisies of civilization. Conan, though, chose to leave his northern homeland of Cimmeria to spent most of his time in civilization, never hesitating to enjoy its pleasures. Conan had a varied career, starting out as a thief, then later working as a mercenary, treasure-seeker, bandit leader, and pirate before eventually leading a revolt and becoming king of a powerful nation. Along the way, he ran into countless dangers, both natural and supernatural. He slew more than his share of giant snakes and oversized ape figures. He rescued quite a few beautiful women from fates worse than death. He encountered more than one evil sorcerer, just about all of whom met their doom on the edge of Conan’s sword. Robert E. Howard committed suicide in 1936, while still a young man. Conan was nearly forgotten for a couple of decades, but then the stories once again found a publisher and his popularity surged. Since the 1970s, there have been countless new adventures appearing in prose, comic books, computer games and movies. Of these, few achieve the same level of quality as Howard’s original yarns. His best tales, such as “Tower of the Elephant” or “Beyond the Black River,” remain masterpieces of good storytelling to this day. Like Tarzan, Conan was pretty close to unbeatable in hand-to-hand combat. When comparing the two, it’s interesting to speculate who would win a fight if they went at it. Personally, I have no idea which of them would win—but, boy, it’d be cool to watch. Tarzan of the Apes and Conan of Cimmeria: They aren’t real, but by golly, they should be. As I've mentioned in one or two earlier posts: Pirates are cool. So, by the way, are old-time radio adventure shows. The Voyage of the Scarlet Queen: "The Lily in the Chimolpo Bar" (7-31-47) Captain Carney accepts a valuable cargo aboard his ship, opening up a can of trouble that includes murder, betrayal and piracy. You Are There: "The Hanging of Captain Kidd" (12-19-48) CBS News provides us with a first-hand account of the execution of the infamous pirate. Escape: "Clear for Action" (6-14-53) In the early 19th Century, an American frigate hunts a French privateer across the Caribbean. Escape: "The Cave" (12-24-50) A young boy stumbles into a fantasy world of pirates and captive princesses. Escape: "Macao" (7-18-51) The beautiful leader of a gang of waterfront criminals learns it is possible to be too greedy. Escape: "Misfortune's Isle" (3-21-48) When the plans of a merchant captain to attack a pirate base go awry, a beautiful stowaway becomes the only hope for the survival of both he and his crew. Escape: "A Night in Havana" (10-22-49) A young criminal plans to go straight--once he settles a few minor matters involving mobsters, smuggling and stolen jewels. I Love Adventure: "The China Coast Incident" (4-24-48) A gang of international criminals use a submarine and the threat of mass murder to gain possession of a secret formula. Can agent Jack Packard foil their plans and save 1100 lives? Dimension X: "Shanghied" (9-26-48) The night before his wedding, a man is shanghied into the crew of an interstellar merchant ship--just as it begins its decade-long voyage to another star. Lux Radio Theater: "Captain Blood" (2-22-36) Errol Flynn recreates his role from the classic film: Peter Blood, a doctor turned slave turned---PIRATE!!! The Man Behind the Gun: "Prep Joe" (2-12-44) World War II PT boat commanders were the closest things to buccaneers in the modern navy, but here one new commander learns that war isn't very glorious. Mercury Theatre on the Air: "Treasure Island" (7-18-36) Orson Welles heads up this excellent adaptation of the classic pirate story. Suspense: "The Tramp" (7-25-56) Three criminals sign aboard a tramp steamer, plotting mutiny and murder. Tarzan: "Pirates of Cape Bandeira" (4-26-51) If you are going to operate a pirate ship off the coast of Africa, do NOT shanghai the Lord of the Jungle into your crew. That won't work out well at all for you. 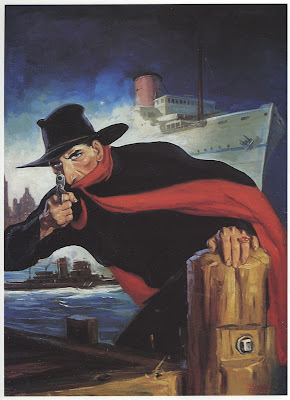 The Shadow: "Death from the Deep" (6-12-38) The Shadow matches wits with a modern pirate who uses a submarine. The Shadow: "Aboard the Steamship Amazon" (7-17-38) Lamont Cranston's pleasure cruise is interrupted by murder and arms smuggling. Your Truly, Johnny Dollar: "The Molly K Matter" (10-10-55 through 10-14-55) When a merchant ship sinks in San Francisco bay, it's up to ace insurance investigator Johnny Dollar to find out whether it was an accident--or sabotage. All of these episodes are pretty easy to find, so if you are in the mood to listen to some nifty pirate and sea adventures, track them down and give them a listen. I suppose not even independently wealthy men like Lamont Cranston or Simon Templer can afford to pay for a parking space in New York City. In both The Shadow and the Saint radio shows, the two crime fighters always depended on cab service to get around. In both cases, the men habitually used the same cab and the same driver. In both cases, the characters of the cab drivers were meant to provide comic relief. Comic relief characters have always, of course, been a part of the pop comic landscape. Heck, in the B-movies of the 1930s/40s, you often got two comic reliefs for the price of one. In the Boston Blackie movies, for instance, Blackie himself was assisted by another reformed thief known as the Runt, a character played largely for laughs. At the same time, Blackie’s nemesis Inspector Farraday was often pulling out his hair in frustration because his partner, Detective Sgt. Matthews, himself often proved to have a light bulb or two out upstairs. 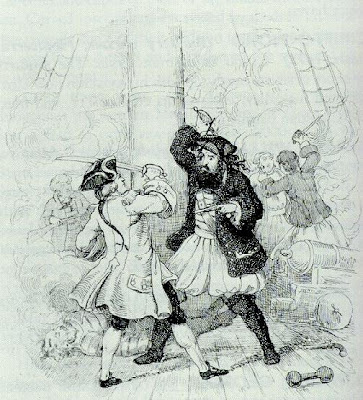 On radio, they often served a duel purpose. Aside from (hopefully) generating laughs, they also provided the main character with someone off whom to bounce expository dialogue. Hopalong Cassidy rode with California Carson, while the Cisco Kid rode with Pancho. Though both California and Pancho were reasonably useful in a fight, for the most part they existed to perform their various comic relief duties. Back east, comic relief often came in the form of cab drivers. The original Green Lantern comic book character, for instance, featured cabbie Doiby Dickles in this role. In the radio version of The Shadow, Lamont Cranston and Margo Lane would often employ the services of Moe Shrevnitz, better known as Shrevvy. The Shadow was a wonderful show, pure melodrama done so well, that it is still satisfying to listen to today. Shrevvy’s shtick was simple: Aside from being just a little dense, he had a habit of saying everything twice: “I was gonna ask you to do a favor for me; I was gonna ask you.” Or “Which is the residence we’re looking for; which is the residence?” It was hilarious. Well, okay, it wasn’t hilarious. It was mostly just annoying. Rather than chuckling at poor Shrevvy, we most often want to just smack him one. The actors who played Shrevvy over the years included Alan Reed, who would later provide the voice of Fred Flintstone in the original animated TV series. Reed was a skilled voice actor with excellent comedic abilities, but the character of Shrevvy didn’t give him anything to work with. The writers of the Shadow were superbly qualified at generating drama and suspense, but they were just plain lousy at comedy. Fortunately, Shrevvy only occasionally popped up in an episode and was usually only around for a minute or two before the Shadow got back to the business of foiling evil. Shrevvy did have his one moment of glory, though. This came in the 1946 episode “Gorilla Man.” As the climax approached, Margo Lane was being stalked through a house by a gorilla. A pistol shot at the last moment kills the beast and saves the beauty. Was it the Shadow who fired the shot? No, it was Shrevvy the cab driver. It was almost enough to make you forgive his annoying speech pattern. Almost—but not quite. When Vincent Price began to play the Saint on radio in the late 1940s, he too got a cab driving comic relief. In this case, though, the cabbie is both funny and likable. Louie (I don’t think we ever find out his last name) is played by radio veteran Lawrence Dobkin, who was adept at both straight roles and comedic ones. The dialogue and one-liners are sharply written and Louie’s common-man demeanor plays nicely off the Saint’s suave personality. Whereas Shrevvy was one of the few weak links of The Shadow, Louie was one of the strengths of The Saint. Louie, as did Shrevvy, also gets his heroic moment during the course of his series. In a 1950 episode that is darker in tone than was usual for The Saint, a woman is murdered trying to protect her child from kidnappers. Louie, setting aside his one-liners for the time being, gets a tire iron out of the cab’s truck and does more than his share of avenging the brave woman’s death. 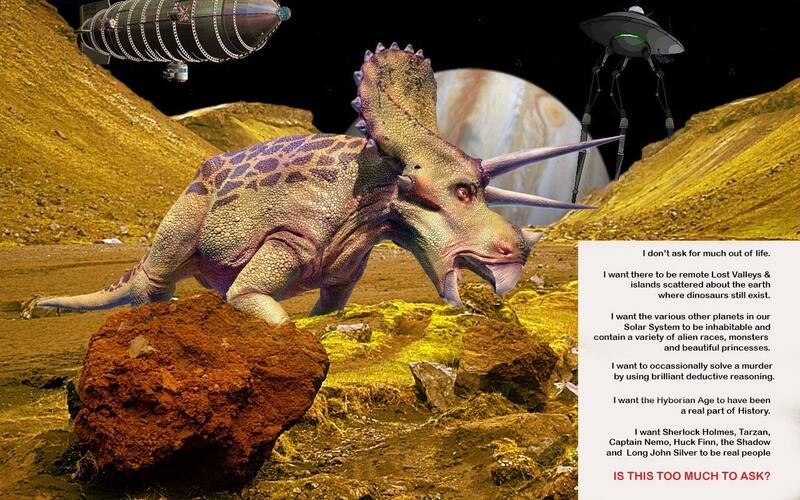 I originally intended this entry to be a part of my “They aren’t real, but by golly, they should be” series. But, whereas the world would be a nicer place if Louie were in it, I’m not sure I mind Shrevvy’s absence from reality. He really, really does need to be smacked. It's better that he remain fictional. My next book will be coming out sometime later this year. 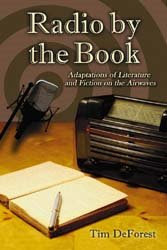 Sorry the image of the cover is so small--I'll post a better one when I can. In 1930, the major outlets for popular entertainment (pulp magazines, movies, radio) were constantly cross-pollinating one another. Ideas, genres or characters created in one medium would soon appear in one or both of the others. The Shadow is perhaps the best example of this. He started on radio as a narrator, jumped to the pulps as a definable character, then jumped back to radio in yet another new version. What happened was this: Street and Smith Publications (who published a zillion different pulp magazines) sponsored a radio show called Detective Story Hour. It was meant to advertise a magazine called Detective Story Magazine. The show used a creepy narrator called “The Shadow,” voiced by James LaCurto and, later, Frank Readick. This narrator proved so popular that people were asking at the newsstands for the magazine with The Shadow in it. The honchos at Street and Smith quickly realized they needed to actually have a magazine with the Shadow in it. So they hired writer Walter Gibson to come up with something. The result was one of the coolest characters ever. Gibson came up with the idea of a mysterious vigilante. Cloaked in a dark cape and slouch hat and armed with a pair of .45 automatic, the Shadow hunted criminals through the mean streets of New York (with not infrequent ventures elsewhere). He was a master of disguise, sleight-of-hand and magician tricks. He was an expert marksman and hand-to-hand combatant. He could blend into any patch of shadow or darkness, becoming effectively invisible. His intelligence and deductive reasoning skills usually kept him one step ahead of the bad guys. He didn't just pop out of the shadows and shoot people--he used his brains as well as his guns. And then there were his agents: man-about-town Harry Vincent, cab driver Moe Shrevnitz, ex-con Cliff Marsland, reporter Clyde Burke and many others. The Shadow would put them to work gathering information, protecting potential victims or tailing crooks--all doing their part in the unending battle against evil. The Shadow Magazine ran from 1931 to 1949, with a total of 325 issues. The incredibly prolific Walter Gibson wrote 283 of these. The individual stories were almost always wonderful adventure tales, full of well-described action, death traps, escapes, hordes of evil minions and some great plot twists. The Shadow’s opponents are always interesting and appropriately dangerous. Gangland’s Doom found the Shadow in Chicago, breaking up the mob that was responsible for the death of one of his agents. In Hands in the Dark, he matched wits with a gang of crooks who were following obscure clues to a cache of hidden loot. The Romanoff Jewels took him to the Soviet Union, battling spies and traitors. The Black Hush is one of several novels with a science fiction element: the villains are robbing banks with the help of a ray that creates pitch darkness. Zemba is set in Paris, where the Shadow and a master spy plot and counterplot against one another, leading up to what may be the single best twist ending ever. Tales such as The Voodoo Master or Cobra featured super-criminals who seemed to be as skilled and dangerous as the Shadow himself. When the Shadow returned to radio in 1937, he was changed quite a bit to adapt him back to that medium. The radio Shadow, though, is still a pretty cool guy. But for now, we’ll remain concentrated on his pulp counterpart—one of the most influential and exciting products of the halcyon days of pulp fiction. Writer Bill Finger and artist Bob Kane never denied that their most famous creation—the Batman—was heavily influenced by the Shadow. But a recent reprint of the 1936 Shadow novel Partners in Peril reveals just how much of an influence the Shadow was. 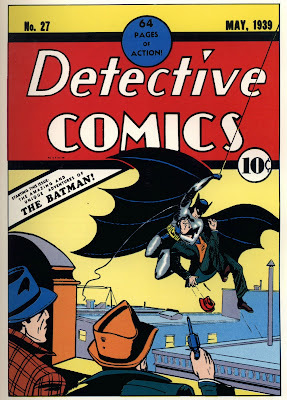 Bill Finger actually lifted the plot from Partners in Peril wholesale for the first Batman story (which appeared in Detective Comics #27 in 1939). But, of course, the two characters are very similar. Both are wealthy men who take on scary identities in order to battle bad guys. They share the same ambience; the same type of urban setting; the same tendency to run across bizarre super-criminals. But there are differences. The Shadow leaves a trail of dead thugs behind him wherever he goes, while Batman (after some early stories in which he did use lethal force) always took villains alive if possible, disdaining the use of firearms. The addition of Robin, the Boy Wonder, also distanced Batman from the Shadow. (It’s difficult to imagine the Shadow with a "Shadow Jr." tagging along after him.) Robin was the proto-typical young sidekick, added to the Batman mythos because the readers of comic books were on average younger than the readers of pulps. But whatever his similarities or differences with the Shadow, the Batman soon became equally cool. Finger and other writers produced some of the best-constructed and strongest comic book scripts of that era. Kane’s unique art complemented the stories perfectly. Bizarre and visually striking villains (most notably the Joker) soon gave Batman one of the best personal Rogue’s Galleries ever. Both the Shadow and the Batman are still around today. A series of reprints of the original Shadow pulps are currently coming out on a monthly basis. Batman's comic book run--despite some creatively weak periods--is still going strong after nearly 70 years. Both characters seem likely to stay around for some time to come. The Shadow and Batman—They aren’t real, but by golly, they oughta be.